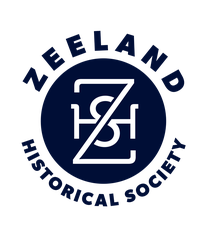 We are open on Thursdays (10 AM to 5 PM) and Saturdays (10 AM to 2 PM). 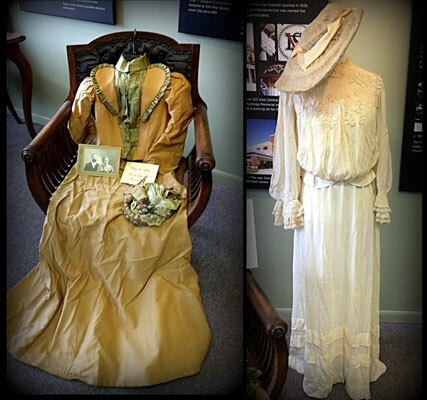 The two oldest dresses on display were worn in 1894. The first, a brownish suit with green trim and hat, is located on the chair near the gallery entrance. 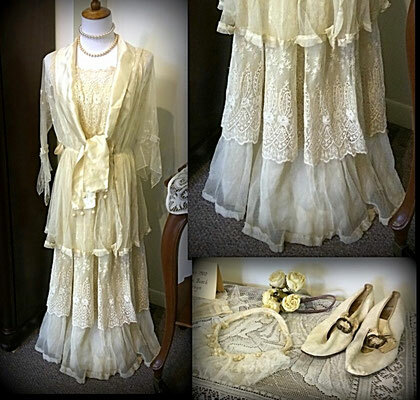 This stylish outfit could be worn after the wedding. 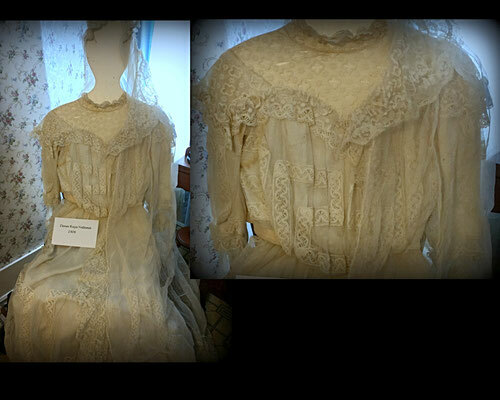 Next to it is the wedding dress of the bride’s sister ten years later. Both brides favored hats. Hanging on the large cabinet at the back of the gallery is the other 1894 dress, one that would be used for the wedding day only. 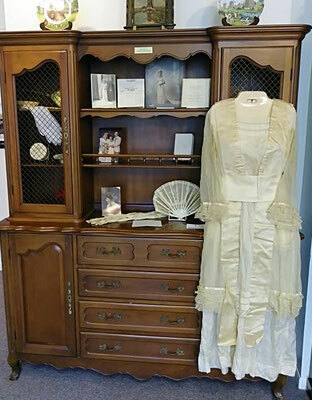 Along with this wedding dress we have a picture of the bride in the dress, her gloves, and her fan. We also have a wedding dress ensemble from 1900, including pearls and shoes. On the small table next to the dress, you will see the bride’s stockings, the small head piece that probably held a veil, artificial flowers from the bouquet the bride carried, and a red paper lantern used as part of the wedding reception decorations. 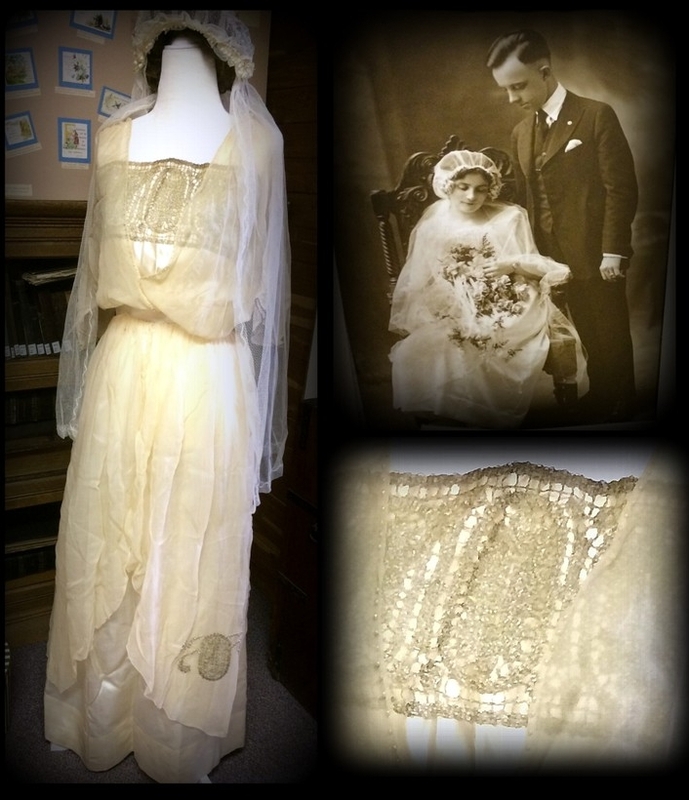 Included in the gallery is one of our three 1920’s wedding dresses. The 1920’s look included a calf length, boxy shift dress, lowered waist, and unaccented chest area. 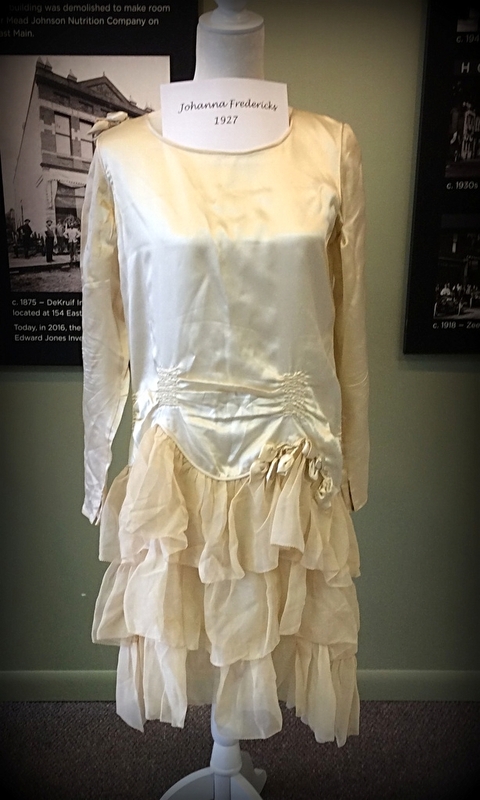 These dresses, while high fashion, were popular among middle class home dressmakers due to the simple design and limited fabric required. 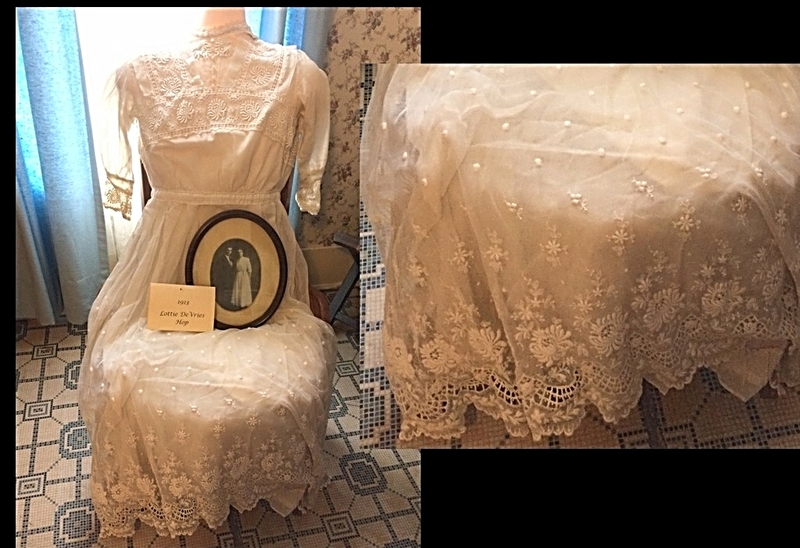 You can find the other 1920’s dresses in the parlor downstairs and in the church room upstairs. 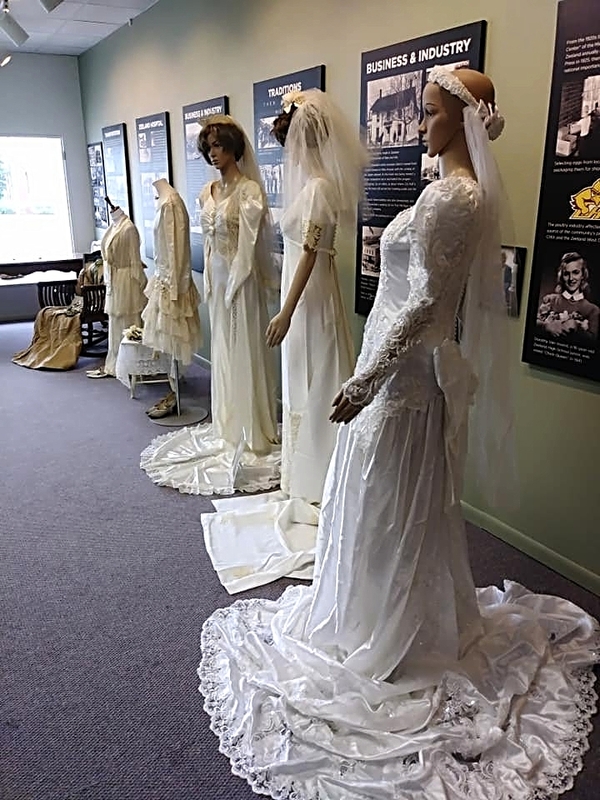 Notice the three dresses toward the back of the gallery. These are dresses belonging to three generations of the Huizenga family, the owners of the grocery store set up elsewhere in the museum. 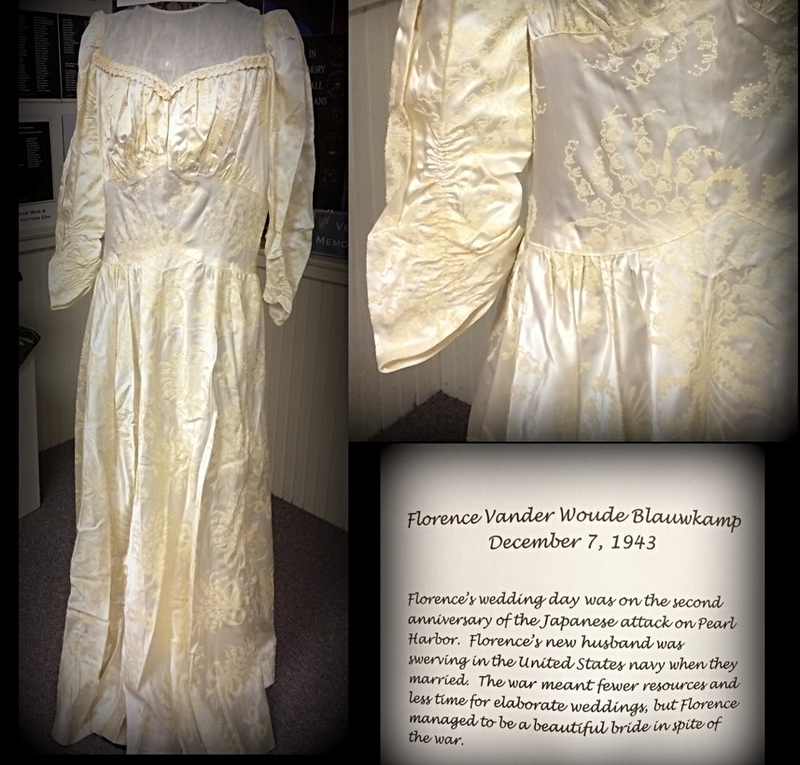 The oldest of the dresses was worn by Genevieve De Jongh when she married Cleo Huizenga in 1945. 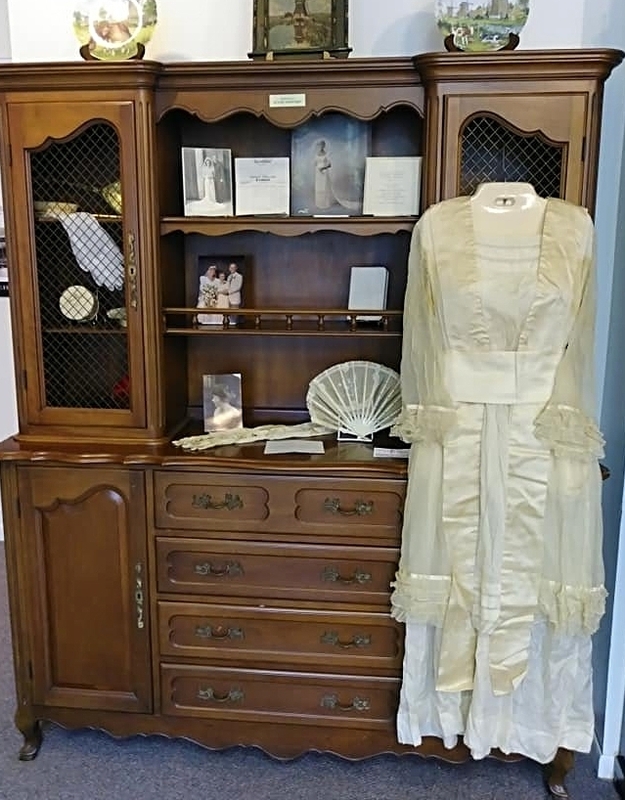 You can see her wedding invitation, wedding picture, and florist’s bill on the top shelf in the cabinet at the back of the gallery. On the shelf below is the Bible she carried. Notice the picture directly below Genevieve’s wedding picture. This color photo shows Genevieve and Cleo, now older, at the wedding of their granddaughter, Lisa Flipse. 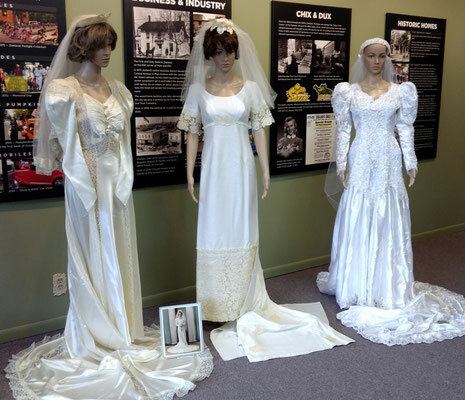 The dresses of Lisa and her mother Elayne round out the collection in the gallery. As you head upstairs, you will see a dress worn by Florence Vander Woude Blauwkamp in 1943. Her new husband was serving in the Navy during World War II. This dress is relatively plain. During the war, luxury fabrics and lace trim were harder to find as the entire country was focused on the war effort, and for many that meant more simplified wedding styles. 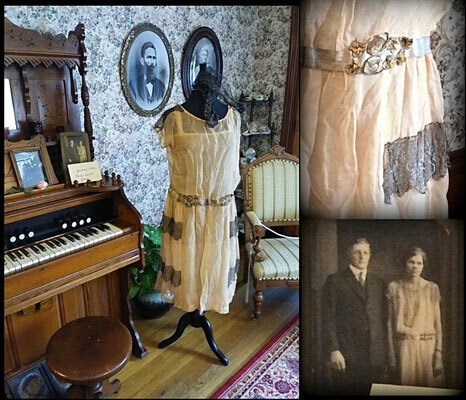 In the Masselink bedroom upstairs, there are two wedding dresses dating between 1906 and 1913. Notice the similarity of style and yet the differences in fabric and trim. On the dresser beside the Dena Ruys Yntema dress is Dena’s tortoise shell dresser set including a button hook, a face powder box, and a jar for rouge. On the bed is her nightgown. 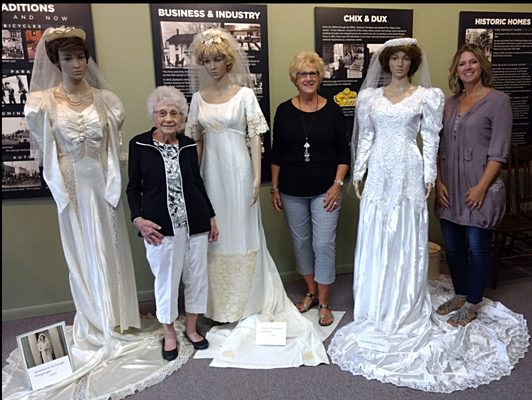 Zeeland brides, whether from town or from nearby rural communities, followed fashion trends, yet each had her own flair. The Zeeland Historical Society is grateful to their families and heirs for donating these wedding dresses so that we can enjoy the beauty of their long ago wedding days and see the progression of wedding fashion across a century.